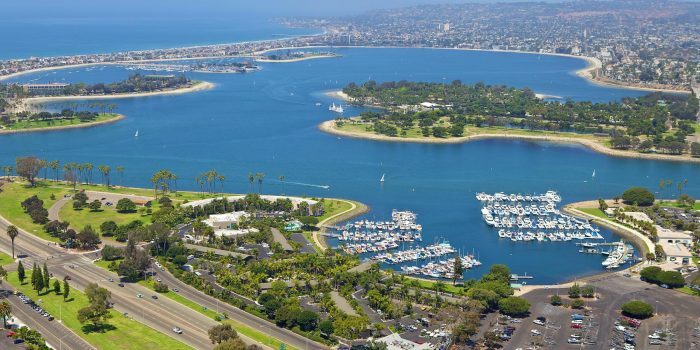 Located just minutes from downtown San Diego, Mission Bay Park is the largest park of its kind in the world. The 4,600-acre aquatic playground is surrounded by 27 miles of meandering shoreline, with a variety of waterways, inlets and islets to explore. There is a 12-mile loop all around Mission Bay, almost all of it on well-marked off-road paths, with water views, lovely parks, beaches, bridges, and an island. There are many options for running here: the entire loop, a 4-mile loop around Fiesta Island, a section along Mission Beach, and lovely paths through Mission Bay Park and Playa Pacific Park. We also recommend the easy and flat 4-mile loop around Fiesta Island. There are also other running and trail options in the area, such as the San Diego River pathway, that branches off near the starting point of our route.